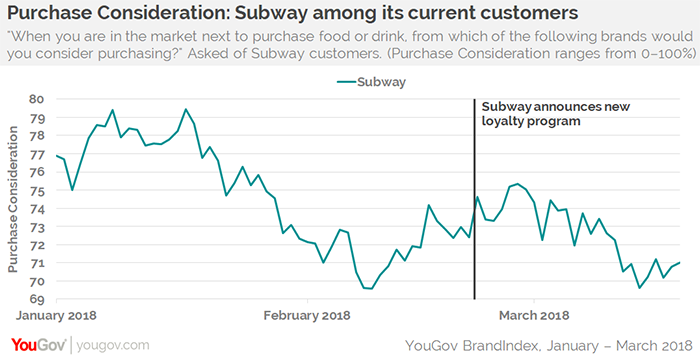 Subway’s latest improvements – a revamped loyalty program, a new set of menu items, and an updated ordering app – seem to have appealed more to the general public than the dining chain’s own customers, according to YouGov BrandIndex. The updated MyWay Rewards program includes more generous redemption rules, an updated app, and small giveaways such as cookies – and is now available at all Subway shops. On March 2nd, Subway unveiled its new Signature Wraps in three varieties. 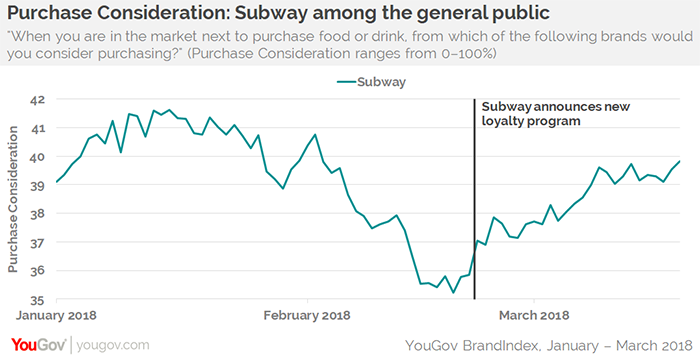 The general public seemed to take to the overhauled Subway MyWay Rewards right away: on February 22nd, the day of the program’s announcement, 37% of all adults 18 and over would consider buying Subway the next time they purchased fast food. That percentage climbed steadily to its current 40%, an impressive feat in the competitive dining sector. Quality and Satisfaction scores have risen since early March as well. However, Subway’s current customers didn’t react the same way. After the plan announcement, this core group hovered around 75% considering buying from Subway the next time they purchased fast food. That changed suddenly over the next three weeks, with Purchase Consideration dropping five percentage points to 70%. At the same time, Quality and Satisfactions scores distinctly fell too. It’s possible that the more substantial MyWay Rewards available at every shop may have acted as a gateway incentive for new customers to try Subway. The “Fast Fresh” redesign emphasizing fresh ingredients and brighter colors in new locations and store remodels may be adding to that enticement. At the same time, falling Quality and Satisfaction scores among Subway customers may be related to dissatisfaction with some or all of the dining chain’s March rollouts, including the loyalty program, the app, and the Signature Wraps.